(April 23, 2011) It is almost that time again! 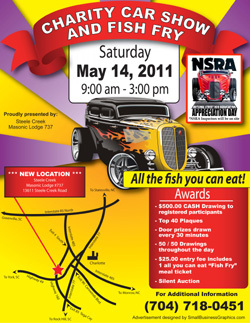 On May 14th, Steele Creek Masonic Lodge will be having their Annual Fish Fry and Car Show Charity Fundraiser. Everyone is welcome to come out and spend the day eating some delicious fried flounder (All you can Eat!) and looking at some of the best hot rods and antique cars in the area. There will be something for everyone, so come out and join your neighbors. 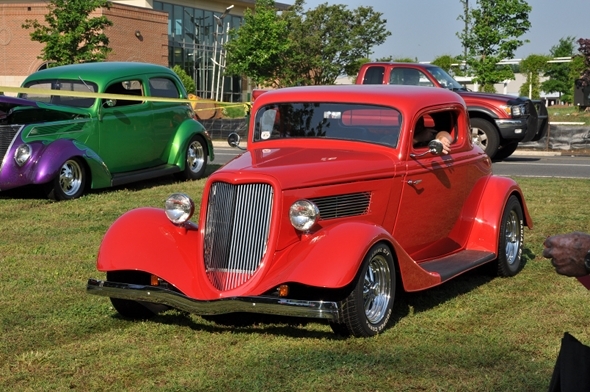 The Car Show hours are 9:00 AM to 3:00 PM, and the show is free to spectators. If you have a vehicle you want to show, there is a $25.00 entry fee which will get you one Fish Fry Ticket and enter you in a drawing for $500.00. All proceeds from the event will be going to te Lodge's Community Charity Fund. Click on the image above for a pdf version of the event flyer. The Steele Creek Masonic Lodge #737 is located at 13611 Steele Creek Road, across from the library and Southwest Middle School. To comment on this story please visit the Steele Creek Forum. Share to your Facebook page.